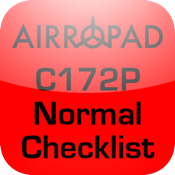 Airropad Checklist C172P is a simple assistance tool for pilots on this type of aircraft (Cessna 172P). This application is not a replacement of the aircraft manufacturer certified checklist and POH. THIS SOFTWARE IS NOT INTENDED TO REPLACE CERTIFIED AERONAUTICAL DOCUMENTS. WE DO NOT GUARANTEE ACCURACY AND COMPREHENSIVENESS OF THE INFORMATION PROVIDED. YOUR USE OF THIS APPLICATION IS AT YOUR SOLE RISK. GIVEN DATA MAY NOT BE ACCURATE. WE REJECT ALL AND ANY EVERY RESPONSIBILITY OR LIABILITY FOR THE COMPLETENESS AND/OR ACCURACY OF THE INFORMATION PROVIDED. YOU SHOULD ALWAYS USE OFFICIAL AERONAUTICAL DOCUMENTATION WHEN PREPARING AND PERFORMING A FLIGHT. THIS SOFTWARE IS PROVIDED 'AS-IS', WITHOUT ANY EXPRESS OR IMPLIED WARRANTY. IN NO EVENT WILL THE AUTHORS BE HELD LIABLE FOR ANY DAMAGES ARISING FROM THE USE OF THIS SOFTWARE. THIS SOFTWARE IS NOT MADE IN CONJUNCTION WITH THE AIRPLANE MANUFACTURER.